Since I started making and taking bento to work a week ago, I feel the need to play some catch up. 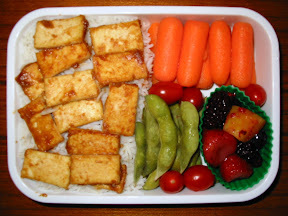 I'd gotten enticed by Yvo's fine work, and had read up further on lunch in a box's tips including how to make tamago-yaki, and fallen across Just Bento as well. There was too much advice to take in all at once. So I bought an 800ml bento, some silicone muffin cups, and I dove in. Monday I made way too much rice—probably at least two cups combined rice and veggies. I didn't rescue myself from the situation by saving some of it for the next day; I just shoved it all in my bento. And perhaps most importantly I didn't season it enough - it's just rice, ginger, carrot, and celery thrown in a rice cooker. However I did several things right: I had chilled edamame ready to act as filler. I had some mixed fruit from freezer bags pre-thawed in the fridge. I had grape tomatoes on hand to fill gaps. I made a successful dashimaki-tamago. So even though this probably took me half an hour prep time in the morning, I was happy. 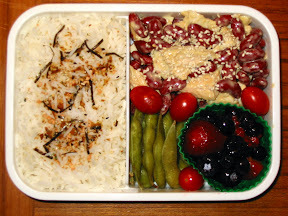 Tuesday I scaled back on the rice, saving that which was too much, and covered it with something with a lot of flavor. The miso-mirin-broth-vinegar combo is a good one and I'll have to try that again sometime. The carrot filler was fine, but not very satisfying. But nothing is wrong with a partial cop-out. I cut my prep time down, too. I started Wednesday's bento the night before, in bed, thinking about what I wanted as I fell asleep. I ended up with a quick kidney bean, mustard, and chicken mix which despite being too strong when I packed it in the bento, was about right when I ate it. Maybe the sesame seeds saved it. Furikake on rice is definitely a good standby to have. I purposely made extra rice for use later. I also used the movable separator that came with the bento box for the first time. I'm not quite sure why I skipped using it before, other than it didn't seem to be necessary, but I've used it since. Thursday I used my saved rice to make a quick fried rice...and learned that you need to flavor it more strongly than usual if you still want it to be yummy later. Ah well. It wasn't awful, just a little bland. I made some more tamago-yaki, and had some seaweed salad Tamara had recommended. It got stuck in my teeth. 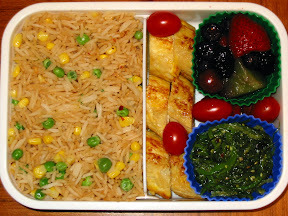 My bento for Friday was my favorite bento of the week. 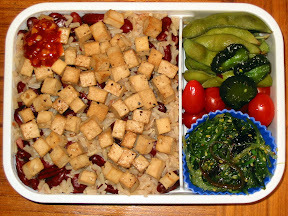 I felt good and nutritious pairing the kidney beans with brown rice, and the soy-mirin-lemon tofu was easy to cook and marvelous even after cooling. The chili-garlic paste is what saved it, though; without that there would not have been enough flavor for the rice. Pickles! Despite Tamara's assurances, they're not quite identical to the ones the restaurant served, but maybe that's from coming in a small plastic bag instead of who knows what the restaurant gets. They're still yummy. The two most important lessons from this week were to season the food strongly, and not to overdo the rice. 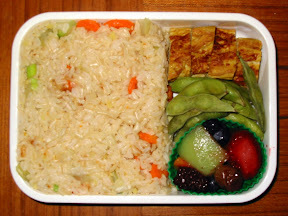 The supporting themes were having enough interesting ready-made side dishes on hand (in this case the thawed fruit, seaweed salad, edamame, and grape tomatoes) to avoid having to prepare time-intensive main or more than one additional side-dish (such as the dashimaki-tamago, or the kidney-mustard-chicken). Coming in a close third is the need to take multiple pictures, as one always comes out fuzzy, way off center, or is otherwise unusable. Oh, and seaweed salad gets stuck in your teeth.